This recipe is sponsored by Thrive® Culinary Algae Oil. How do you make Healthy Paleo Baked Apples? Super quick and easy . . . that’s how! 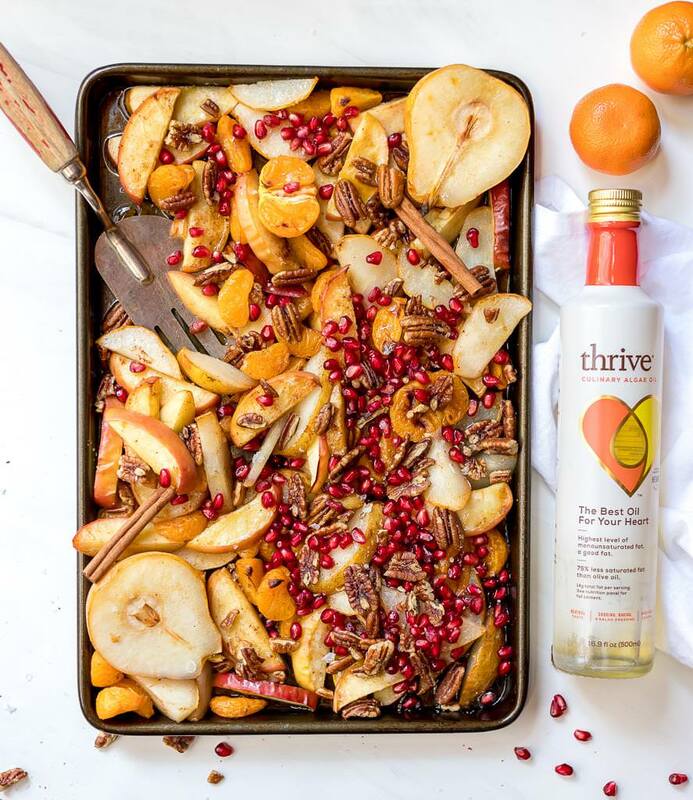 Seriously though, just slice your fresh Fall/Winter fruit, toss with Thrive Culinary Algae Oil and spices then broil. 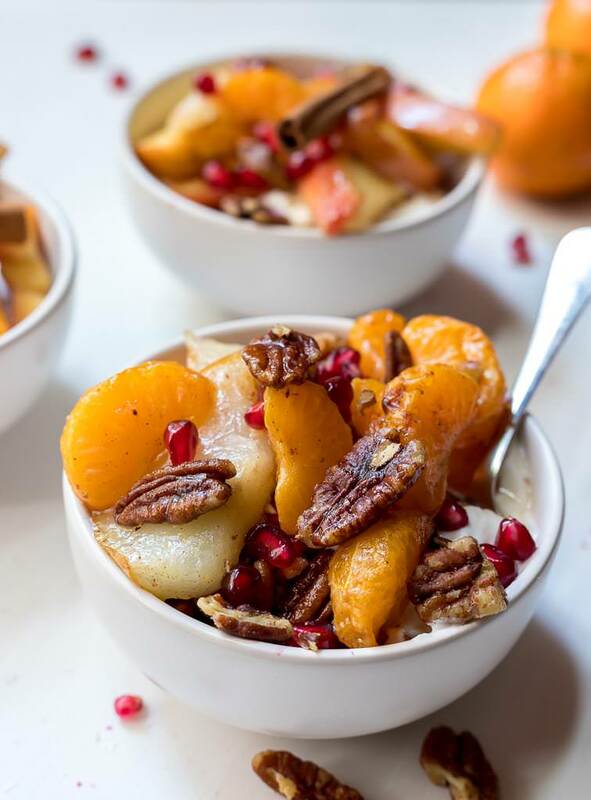 This is The Most flavorful fruit topping you can make and perfect for the holiday feasts! I am proud to be partnering with Thrive Culinary Algae Oil again throughout the holiday season. 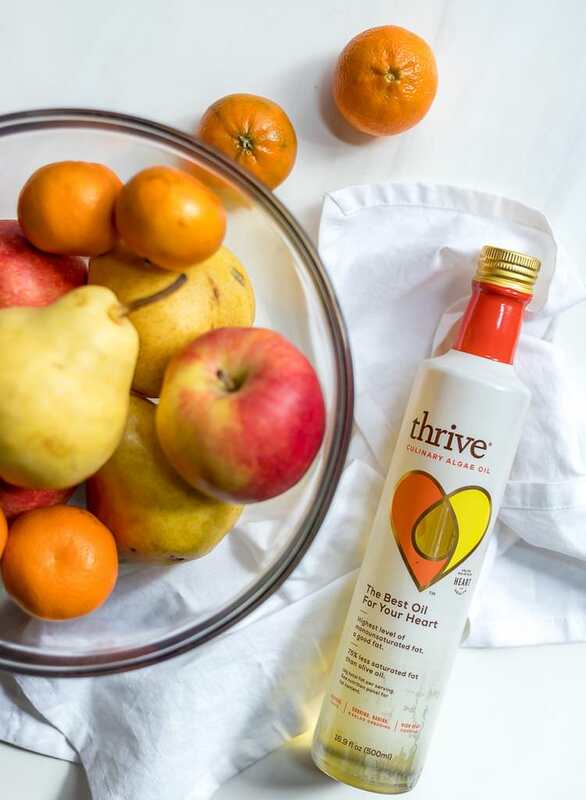 I have several delicious recipes that feature Thrive Algae Oil and show how this everyday oil can be used for all kinds of cooking and baking: Butternut Squash Pasta Salad, Easy Cheesy Twice Baked Potatoes, Crispy Roasted Chickpeas, French Onion Chicken Casserole, Zucchini Tater Tots, Black Bean Burgers and Sweet Chili Sauce. I love cooking with Thrive Culinary Algae Oil because it has a super high smoke point (up to 485ºF) and an extremely neutral flavor. There’s no greasiness and no aftertaste like avocado and coconut oils can leave – just fresh fruit and spice flavors! Plus, Thrive Culinary Algae Oil has 75% less saturated fat than olive oil, and no other oil has a lower percentage of saturated fat. So it’s a better choice to help maintain heart health. How do you make Baked Apple Slices? Yes, this is why this recipe is so quick. Slice the apples and pears that way they cook evenly and much faster. Broil on high for 10-12 minutes and that’s it! 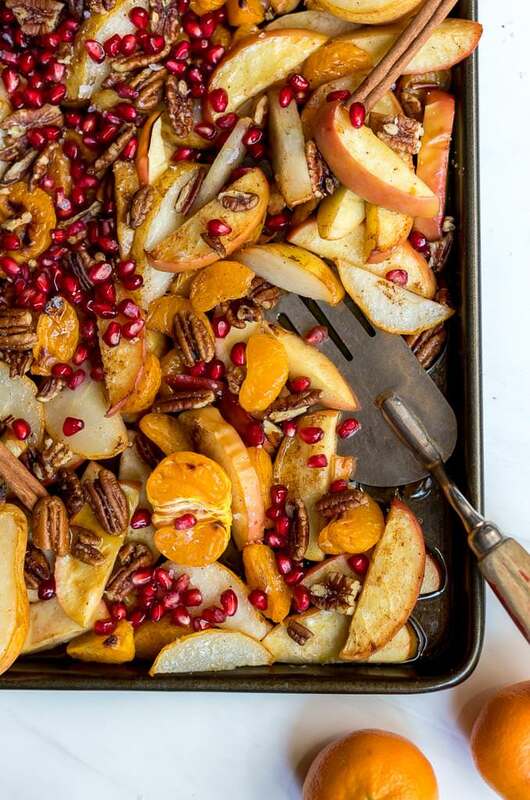 Stir in the maple syrup (which is optional), pomegranate seeds and roasted pecan or walnuts once the fruit is done broiling. What type of apples should you use? I use gala because I like the flavor and consistency and they seem to cook fairy quickly. But feel free to use your favorite apples. What if you don’t want any added sugar? You can totally omit the maple syrup. The fruit itself adds a sweetness so it is not absolutely necessary. Absolutely! This tastes wonderful cold too. Store in your refrigerator then just serve cold or reheat in the microwave before serving. 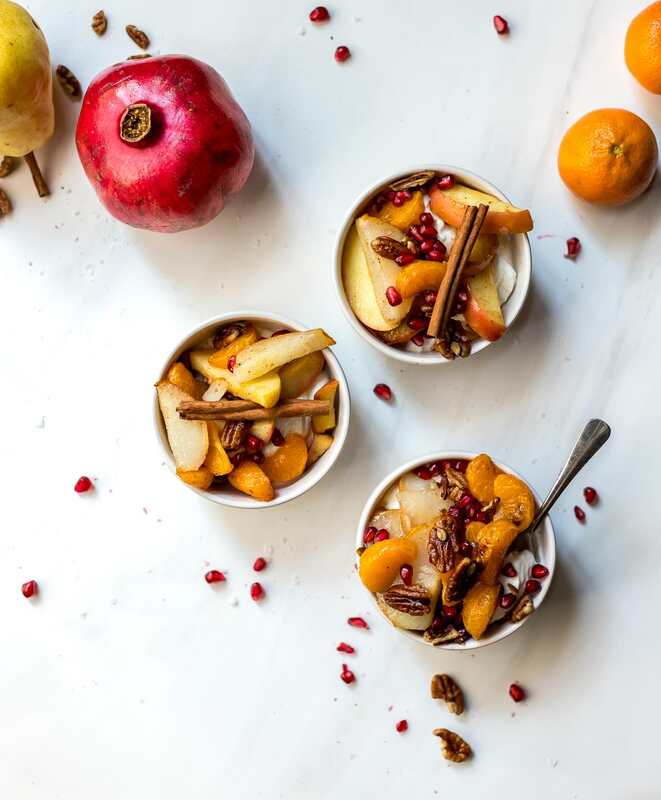 What should you serve these baked apples and pears with? Yogurt, oatmeal and cheesecake are the obvious choices. But really, this is great on cakes, pies, ice cream, dessert dips or even alongside your turkey dinner. Here are a few more serving ideas: Paleo Slow Cooker Turkey Breast, Mini Pumpkin Cream Pies, Brown Butter Glazed Bundt Cake. 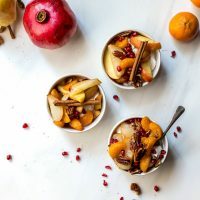 Not only is this Spiced Baked Apples, Pears and Mandarins recipe great for holiday feasts, it will make your house smell divine! And how gorgeous is this on top of yogurt, oatmeal or desserts!?!? It’s not often that you get a recipe that is nutritious, beautiful, simple, quick and a guaranteed crowd pleaser. But this checks off all of those boxes. Serve immediately or store in an airtight container until use.